The first thing that strikes you about Hong Kong is a city of stark contrasts. Gleaming skyscrapers adjacent to squalid tenements; Maserati’s weaving around ramshackle bicycles; the super-rich living along side poverty-stricken residents. Hong Kong’s income gap is the most pronounced in all of Asia, with the middle class only making up about 7% of the population. Sights like the one below are quite common. This mid-rise building complex consists of government subsidized apartments directly above trendy clothing shops replete in shiny chrome, glass and marble walls. 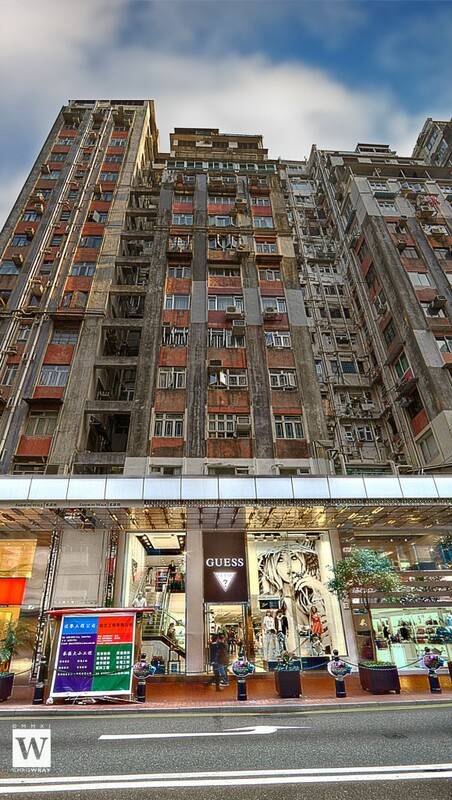 It was an odd sensation to experience the Madison Avenue feel when strolling along Hong Kong’s Fashion Walk, while at the same time you see the crumbling, urban decay of the apartments above. Despite this dichotomy, Hong Kong is a remarkably harmonious place and I found the people to be friendly and outgoing. Stay tuned for more of my travel photo diary. Next stop: the famous Victoria Peak and harbor skyline.